If you are looking for Naples resorts you've found the perfect place. Whether you want to vacation here in beautiful Naples Florida or planning a convention. Whatever the occassion there is a perfect Naples Florida resort for you and your family and I'll do my best to guide you in the right direction. So let's get this resort "match making" started! The Naples resorts featured here either have on site golf courses or you are given the option to shuttle or drive to the "off site" golf course. This usually happens when you want to stay at the beach but your husband wants to play golf. If you're coming to Naples, there's nothing like staying right on the beach and enjoying the wonderful gulf breeze right in your living area. Plus you'll also have access to pools, restaurants, bars, and fitness centers at most of the places mentioned here. My local favorite. A gorgeous one of a kind property with lots to offer. Must see. One of Naples original tourist attractions. Golf course on property and in the perfect location. You're right by downtown, the Pier, 5th avenue, and everything else. Another awesome option in Naples at one of my favorite beach areas... Clam Pass. Luxurious, high end, and "boutique"
A few of Naples finest accomodations that are NOT beach front or on a golf course. That being said, most of these are all in great locations. Many are within short walking distance of the beach, great shopping, fishing, or even golfing. On the bay with access to boating, a pool, and the fun to walk around downtown area. In the heart of downtown Naples right on popular fifth avenue south. Easily walk to your favorite shops, restaurants, Starbucks and the beach. A beautiful little piece of paradise in beautiful Olde Naples. You're less than 3 blocks from the beach and within quick walking distance to fifth avenue and third street south. A luxury hotel in Old Naples. They have studios plus 1, 2 and 3-bedroom suites. All less than a couple of miles away from the beach and a bunch of other great attractions. Rent a bicycle and you'll love your stay! 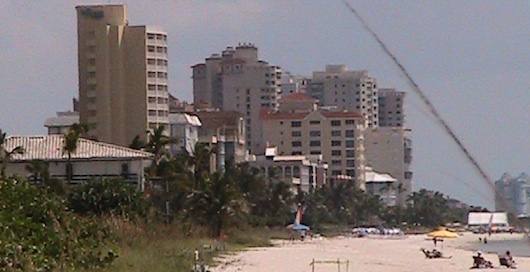 Walk to Tin City waterfront area and more from this luxurious 58 room Old Naples hotel. Resort feel at a price that won't make you cry when you get back home. You should check out our hotels section. Don't worry, you can still get great deals while staying in the heart of Naples. You should always do a quick check on prices at the resorts I've listed here because you'll never know when they're running a special promotion.